Samsung has launched Samsung Galaxy Tab A 10.5’’, a new tablet that gives you great entertainment experience. Featuring new entertainment options and enhanced audio and visual features, Galaxy Tab A 10.5’’ is ideal for enjoying your favourite movies or shows at home or on the go. With Galaxy Tab A 10.5’’, you can watch movies, play games, listen to music or browse content on a 10.5-inch immersive display screen featuring a large 76.3% screen-to-body ratio with slimmer bezels. Now enjoy a 3D surround sound experience as the Galaxy Tab A 10.5 is equipped with quad speakers powered by Dolby Atmos. The device has a significantly enhanced battery that allows up-to 14.5 hours of video playback, and also features LTE support making it an entertainment powerhouse. With Galaxy Tab A 10.5, users can easily control their home appliances via SmartThings with just the touch of a button .Galaxy Tab A 10.5” sports 8MP rear camera with flash and a 5MP front camera, both designed for stunning photography even in low light. The all new Galaxy Tab A 10.5’’ also features the latest Kids Mode, designed to make learning and entertainment simple, safe and fun for kids. Kids Mode is a new way to introduce children to the tablet experience that is ideal for easy and visual learning for even the youngest users. Kids Mode gives parents the controls that is needed to manage usage time and ensure content, from native applications and brands, is age appropriate and educational. 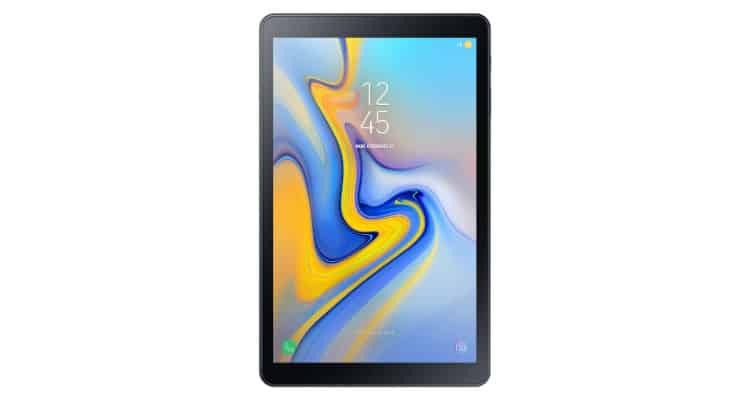 “Galaxy Tab A 10.5’’ is Samsung’s latest addition to the tablet line-up and comes with capabilities that make life easier and more entertaining for the whole family. Featuring a refreshed design, larger display, thinner bezels, quad speakers with Dolby Atmos and enhanced 7300mAh battery, Galaxy Tab A 10.5” makes it a complete family entertainment device,” said, Aditya Babbar, General Manger, Samsung India. Galaxy Tab A 10.5” also features Samsung’s Always-On-Daily Board, a new bulletin board-like experience that gives you the information you need. Simply connect the device to a Charging dock to access important information, whether it is your local weather or family photos from your latest vacation. Consumers can also use Multi-User Mode on the Galaxy Tab A 10.5’’ to create various accounts on the same device. All these innovative features allow easy handling of the device to ensure that everyone in the family can customise it to their individual needs. Galaxy Tab A 10.5” will be launched at a price of INR 29,990 and will be available from August 13, 2018 onwards in Ebony Black and Urban Blue colours on Samsung Online Shop and Flipkart, online exclusive partner. It will also be available in leading offline retail stores. Customers can pre-book the tablet on Flipkart starting from August 9, 2018. Galaxy Tab A 10.5” customers on Jio 4G would be entitled to get instant cashback of INR 2,750 on recharging with INR 198 or INR 299 plan. Customers will also get double data benefits on every recharge for the next 4 recharges, giving them the freedom to enjoy streaming cricket, music, video and much more. Samsung introduces an Ultimate Entertainment Device: Galaxy Tab A 0 out of 5 based on 0 ratings. 0 user reviews.